The Museum will welcome Yogi’s former teammate, all-star and world champion (’61 & ’62) pitcher Jim Coates. ALWAYS A YANKEE tells the story of Coates’s challenging journey to baseball stardom, and the fiery competitiveness and determination that saw him through. 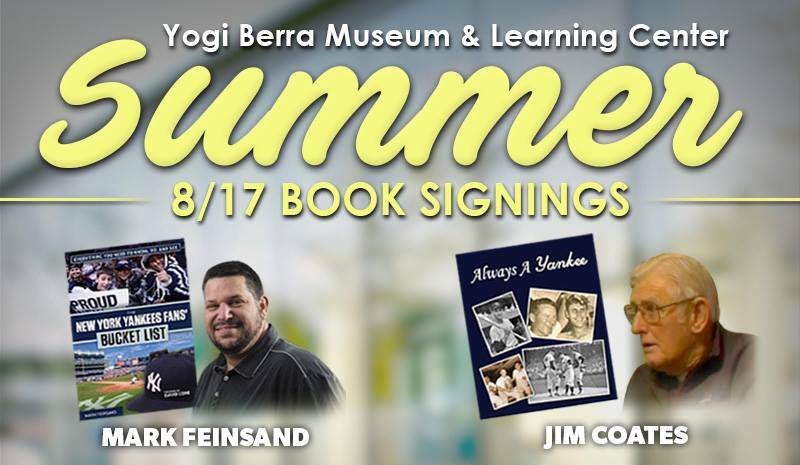 The Museum will also host Mark Feinsand, author of THE NEW YORK YANKEES FANS’ BUCKET LIST. From visiting Stan’s Sports Bar to sitting in the bleachers for the roll call, Feinsand provides ideas, recommendations, and insider tips for must-see places and can’t-miss activities near Yankee Stadium, as well as some items long-distance Yankees fans can cross off their list from the comfort of their own homes. Books are $20 each. Reserve your copy today by calling (973)655-2378. NJ Jackals will play the Rockland Boulders at 7:05 p.m.